Yoga Teacher Training in India! We are a traditional Yoga School in Kerala, India for serious spiritual seekers, guided by Swami Santhiprasad, our spiritual leader and inspiring Yoga Master and Yoga Guru with over 50 years of experience in studying, practicing and teaching Yoga. School of Santhi Yoga School in India are recognized and registered by the Indian Government and listed among the authorized Yoga Institutions in India and registered under FC(R) A 1976 with Ministry of Home Affairs, Government of India. According to the new Indians regulations from 2010 onwards all students studying Yoga in India have to arrive with a valid Student Visa. To qualify for a Student Visa you have to be accepted as student at an institution authorized by the Indian Government. To be authorized by the Indian Government the School need to fullfill the demands from the Indian Government. This is a guarantee and quality assurance for the Yoga student, as it shows the Yoga Teacher Training institution are trustworthy with professional Yoga Teachers what ever level you sign up for. When you apply for a Student Visa all Indian Embassies around the globe will demand a letter of admission from an authorized Yoga School. by Yoga Alliance US at level TTC 200 and TTC 500. Yoga Teacher Training program in three levels to mend efficient yoga teachers during two to three years with in depth knowledge in the Science of Yoga, Prana, Kundalini Yoga and Meditation. is designed with a view to enable the participants who are successfully completing the program to professionally train people in Yoga. All students who, after examination, successfully complete the program will be certified. in this Yoga Teacher Training program. 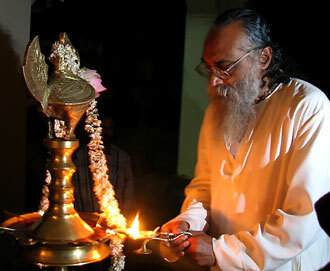 SAMKHYA YOGA, Raja Yoga, Jnana Yoga, Bhakti Yoga, KUNDALINI YOGA, Swara Yoga, Kriya Yoga, Hatha Yoga, Karma Yoga and Swami Santhiprasad's own experience. purification programs such as Shat Karmas, Pranayama, Yoga Asanas, withdrawal of senses, the different functions of the mind, psychical activities, psychical energy centres, its functions and healing, meditation, concentratration, etc. There will be sessions for imparting practical training in teaching Yoga. The participants during the course will get sufficient tools and confidence to handle all kinds of situations one may come across while imparting training in Yoga and initiation to Kundalini Meditation. School of Santhi Yoga Teacher Training program include 500 hours training in Yoga Asana practises alone to enable the students to teach Yoga Asanas. 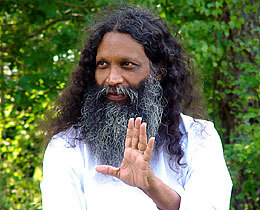 Besides the program include Pranayama, Kriyas, Chanting and Meditation. Students will be given appropriate training in Pranayama practices to establish control over the vital force, which in turn will enable them to reduce the activities of the mind. When activities of the mind are reduced, the mind will be in a state of concentration. Concentration will in turn results in Meditation. Techniques of healing through Kundalini Yoga by rebalancing and energizing the chakras will be studied in detail. We are living in a world of stress, strain and tension. When there is accumulation of tension in the mind, the body will naturally become fatigued. Gradually it will be impossible to carry out our daily life in an effective way. If we are not taking care of this it will inevitably end up in sickness, both physical and mental and gradually we will ruin our precious opportunity to be here to experience, understand and feel the innate freedom. Don´t hesitate to contact us by phone or email if you would like more information. 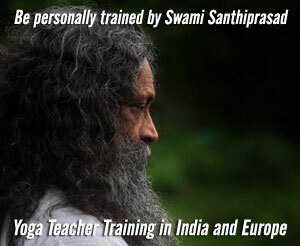 You are most welcome to participate in our Spiritual Yoga programs at School of Santhi Yoga School in India and Europe!